A detailed review of Takagi tankless water heaters from T-K4 series. What to look for when buying tankless, available models and top features. Buying tips. Where the T-K4 heaters can be used and how hard it is to install one. Takagi manufacturer has been designing quality water heating devices for over 70 years. Most of the new models come with the condensing design, which is using the latest advanced technology, while others, which are also cost-effective, are non-condensing, still offering energy efficient solution and reliable operation. Takagi T-K4 models are tankless and non-condensing water heaters that are designed for residential water heating in high demanding homes. They can also be used in recirculation systems, hydronic and radiant floor systems, and in combination with the water storage tanks, in direct or indirect setup. Some of them are using natural gas, some propane, and installed either indoor or outdoor. Takagi T-K4 series of tankless water heaters are built to provide great comfort to its users and with the provided remote controller – convenience, and at the same time save energy, floor space, and money. All the models are small (20” x 14” x 9”) and lightweight (43-45 lbs. ), making them easy to handle and hang on the wall. Just by looking at how T-K4 works, you will see that savings are expected due to its great engineering. Water is heated on demand while passing through the heat exchanger and hot water is supplied to the shower almost instantly, in an endless supply and continuously. With such an innovative design, you will never run out of hot water. With the capacity to heat up to 3 showers simultaneously, there will be plenty of hot water for your large family. Even teenagers. And with the advanced features, hot water is always hot, and delivery is uninterrupted. There will be much less temperature fluctuation, also known “cold water sandwich”, to deal with. Also, as there is no storage tank, water is not losing the heat when not using it (no standby heat loss). Takagi T-K4 water heaters are non-condensing which means that the units use one heat exchanger and there is no water preheating. And, the energy efficiency is still high, it is around 0.80. Takagi T-K4-IN is a water heater designed for indoor installation only using power vent or power direct vent for more flexibility in the installation. The flue pipe has to be per codes, Category III and made of stainless steel, with the exhaust vent diameter of 4”, which can run horizontally through the wall or vertically through the roof, and up to 50 feet in length. 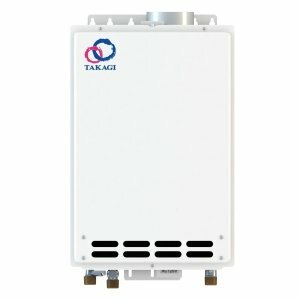 Takagi T-K4-OS is the gas tankless water heater designed for the outdoor installation only and is using the built-in power vent to move the products of combustion out. Since it is installed outside, it continuously uses the fresh air for gas combustion. T-K4-OS model frees up an indoor space, eliminates the danger if the gas leaks and saves money since it does not use any vent pipes. Takagi also offers the recess box, TK-RB02, so when the water heater is installed in it, it is protected from various weather conditions and abuse. Both indoor and outdoor units are small and lighter than the water tank heaters, so wall-hanging design allows you to free up the floor space. Takagi T-K4 water heaters are using the tankless technologyfor the on-demand water heating while providing a continuous and endless supply of hot water. During the water heating, water heater adjusts its power by using the fully modulating gas valve, for the optimized operation. The modulation allows water heaters to work in the range from the minimum 11,000 BTU to the maximum of 190,000 BTU, either using the natural gas (N) or propane (P). In both cases, the energy factor is around 0.80, which makes these units energy efficient and also green, with the reduced emission of greenhouse gases. A remote control is included for the convenient use - the temperature of the hot water can be set in the range from 99 F to 167 F (16 options), also to monitor the heating operation and notify when something is wrong with the unit. If the remote control is not used, you can select one of four temperatures by changing the dip-switch settings on the computer board: 113, 122, 131 and 140 F where the 122 F is factory preset value. Takagi T-K4 series is built to provide enough hot water to homes with 2.5-3.5 showers working simultaneously. The number of fixtures the unit is about to supply depends on the temperature rise, application and the peak flow rate requirements. So, when used in warmer regions, if for example, the temperature rise is 30 F, the maximum flow can reach 8 GPM, while in colder regions where the temperature rise is 100 F, the maxim water flow can be up to 3.1 GPM. The minimum flow rate, which activates the water heater, is 0.75 GPM while 0.4 GPM is the minimum flow that keeps these gas water heaters running. T-K4 water heaters are self-diagnostic. The diagnostic system allows easy troubleshooting and repair. If something is wrong with the unit, and you have a remote control TK-RE02 installed, the error code will display, or if the controller is not installed, the red LED light will be blinking. A water heater uses the electronic ignition to light the gas burner. Except for the igniter, the unit is also equipped with the flame sensor, right above the burner, to “inform” the electronic board if the flame is present or not and stop the gas delivery in a case of the emergency. Internal freeze protection system with the provided electrical power. It activates when the surrounding temperature drops below 36.5 F.
A manual reset hi-limit switch ensures that water temperature does not exceed safe levels. Exhaust and water temperature safety control. Overheat cutoff fuse to protect the heat exchanger from the extreme temperatures. Air fuel ratio (AFR) sensor ensures proper gas combustion, reduced emission, and maximum efficiency. Gas and water connections: 3/4"
According to the user reviews, Takagi T-K4 water heaters, either indoor or outdoor model, are a good investment. They are affordable and provide comfortable and convenient water heating. The most praised features are the continuous and endless hot water, including small size, high efficiency, and higher savings than the old tank type (where replaced). For those homeowners with the basic plumbing knowledge, the manual and installation were straightforward. It was an easy DIY installation. Except for some comments that it takes longer than the tank-type to get hot water, temperature fluctuation and lower power when more applications are used, there were no major issues with the T-K4. The produced hot water flow rate was good enough even for families of 5 and with 3 showers running at the same time, but the water flow and pressure were limited. If you are looking for a small and compact tankless water heater with an endless hot water and on-demand operation, and need a cost-effective solution for a 2-3-bath house, Takagi T-K4 is the heater you might want to consider. High energy efficiency and reduced gas emission ensure savings and better environmental protection, and with the computerized safety system, your family and the household will be protected. The manufacturer provides a long 15-year warranty on the heat exchanger, 5 years on other components and 1 year on labor.